Home / News / nokia / Nokia Lumia 920 / Photography / Photo Gallery: Bangkok with @nokia Lumia 920 @PureViewClub !! 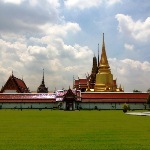 Photo Gallery: Bangkok with @nokia Lumia 920 @PureViewClub !! Check out the latest photos around Bangkok, Thailand by Rizky Adriansyah on Flickr which were shot by Nokia Lumia 920 with PureView Technology. There are no post editing process for all the photos, so enjoy all the photos and please leave any comments below. More photos taken by Nokia Lumia 920 & Nokia 808 PureView will be added later today. All the photos are taken at Chao Phraya River, Wat Arun, Wat Pho, Grand Palace and Madam Tussaud Bangkok Thailand.